Welcome to Photo Art Friday for September 14th, 15th. this week you can use the prompt to compose a seven word sentence that describes your life or experience or process as an artist (be it a photographer, painter, mixed media artist, digital artists, whatever ...) and marry your sentence to a piece of photo art that somehow illustrates your sentence. This is a manipulated photograph of my youngest of two grandaughters. At that age she looked remarkably like me at the age of two and as she grows it becomes evident we have many physical and personality traits in common - one of which is insatiable curiousity. 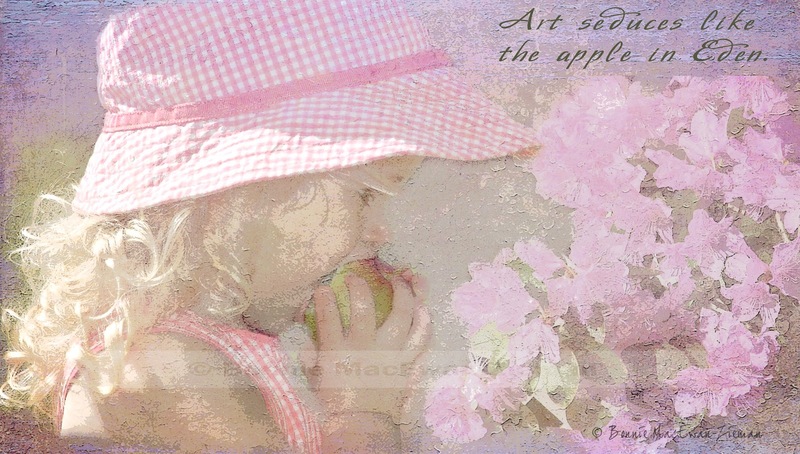 I chose this image of her as the thumbnail icon for my blogs because the biting into the apple has a lot of significance for me. I was raised in a strict fundamentalist, end-of-times religion where devotion to God meant one had to reject the knowledge, education, entertainment, activities, opportunities, culture of the 'world'. Metaphorically, we were strictly forbidden from enjoying the succulent, juicy fruit of the culture around us. As a young adult, I found the courage to walk away from such a primitive, stultifying, harsh, dogma-driven way of life. Every new arena of life that I embraced felt like another bite from a forbidden fruit and it was a joy to embrace a life of choice and exploration - openly and fully. There was, of course, a price to be paid for choosing liberty of thought and to indulge my natural curiousity, and freedom of action. Anyone who dares to leave that fundamentalist religion is shunned by their friends and family for making the choice of freedom over faith in their interpretations. It was a hard price to pay. But ultimately there was no other choice I could make, as anyone who has made difficult choice for the exercise of free will, will tell you. All that to say, because every minute of our day in that religion was spent studying scripture, studying their publications that interpreted scripture, going to several meetings each week, and going door-to-door to spread the 'good news' that God would soon destroy the wicked and establish a paradise right here on earth, etc., etc., etc. (Yes ... I was one of those people who bang on your door and try to tell you how wrong your religion is, so that you will convert to mine. Apologies!) Thus there was no time or permission to explore the world, the arts or my own creative potential. I had to suppress any and all creative instincts. So the image above was made to try to illustrate how now each and every foray into artistic expression tastes like a sweet bite into formerly forbidden fruit. Sheer joy!!! As always, interpret the prompt ANY way that pleases you. While we can use a prompt to help give us focus, do feel free to push the boundaries in any way your inner muse suggests! My husband is still in hospital (and doing well), so I am spending my days there, of course. Thanks so much for all the care and concern you have expressed. May not get to your images/sentences right away, but I WILL visit each one! Oh Wow! not very eloquent I know but thats just what came out of my mouth when I finished reading your post. You will have no idea how much I appreciate your encouragement in my artist endeavours Bonnie and now I can 'see' where you are coming from I understand something more about me. Glad to hear your husband is doing well. Take care. This is beautiful, Bonnie. I am sorry you had such a bad experience. I fear, though, that religion, rather than the love of Jesus Christ was what was crammed down your throat. I never experienced MORE freedom than when I came to know Him as Lord and Savior. I do believe the Bible to be the Word of God, but so often it can be twisted under ones who desire to use it for control. I pray you would know His great love and mercy that tastes sweeter than any fruit that this fleeting life has to offer. Blessings to you and prayers for your husband. Thanks for hosting this great emme. Beautiful post Bonnie. We each must travel our own path not what others dictate for us. Thanks for hosting Photo Art Friday. Take care, Jen. Bonnie, I'm glad to hear your husband is doing well and hope he continues to heal. Wow, your post is so powerful...what a courageous human being you are. It must've taken so much strength to walk away from family and friends at such a young age, but I certainly understand your reasons for doing so. The image you created is a wonderful representation, and your granddaughter is beautiful! Thanks so much for sharing. Indeed you have shared a deep inspiration, Bonnie, and I applaud your courage. It is hard to live our own lives that so often fly in the face of what we were raised to BE, DO, and follow. The real gem here is the photograph and the memory, how you linked the similarities as well the differences. I am moved to consider your share and to let it sort of sink in. So glad your husband is on the mend and that you are able to find a balance in Life. Your inspiration and encouragement truly brighten my Life. Dear Bonnie, it was a courageous act to walk away and also tell us your story. I walked away from a situation many years ago and lost my son in the process (even after 40 years he cannot forgive). And it does take courage to find one's personal freedom even within a circle of family and friends. Hugs. I have always admired your artistic talents, but until today had no idea how broad and sweeping they are. You express in words with the same grace as you express in your artwork. I am moved by your strength and your courage. I am moved by your talents and by the kindness you show in your sharing of them. As difficult as your young days had to have been, you gained the strenth to stand up to them and to become your own person. I hope you have an appreciation of self ... you are a rare gem. Best wishes to your husband and your family. And, not to be forgotten, your beautiful granddaughter. A very inspiring story. I felt suffocated while I was reading your moving post. Those of us who rebelled as teen agers against what we felt was an old fashioned upbringing had no idea of what true repression really is. Best wishes for your husband's recovery. This is a beautiful image of your granddaughter. So glad your husband is doing well and hope he can go home soon. Your portrait of your granddaughter is so precious, Bonnie. Thank you for this great, thought-provoking prompt! Such a beautiful and very meaningful image that you have created and shared with us today Bonnie, thank you :) I do hope your husband is doing well. Congrats on your Flower Art Friday win this week! I used your "Nitty Gritty" texture on my image for today and I just love it. Thanks for your generosity in providing these textures! Bonnie, This was an awesome challenge. It really made me think. The entries this week are amazing. - Your piece and words were so filled with emotion. I am sorry to learn that you experienced such a turmoil in regards to your faith. I agree with Michelle, (Religion) often gets in the way instead of a "Relationship" with a Savior. I'm happy that you've found such a creative outlet in your life. Keep on sharing. Bonnie, what a huge journey you've had. I am so impressed by what you've been through and what you've overcame! This experience have made you a great person!!! This week theme made me think a lot about my life. Thank you for that. I was really looking forward to participating in the 7-word challenge but the inlinkz button seems to have disappeared, or am I going mad? I've looked on previous posts and all the links seem to have disappeared too so it's not possible to view other people's contributions to previous challenges. oh Shoot,,I was so looking to entering this challenge and did not realize the linky is closed..BOO! !